Garden-Route based electronic music producer Jumping Back Slash brought his ‘Afrotroniks, gqom romance, afrikan tekno, mshini soul music’ to SOAS Radio whilst in the UK for the launch of his latest EP ‘Slow Oceans’ on Peckham based label Cotch International for a chat and to play a live set in the studio. We talked about the release, collaborations with Nonku Phiri and Hlasko, the disparities and similarities between the scenes in Cape Town, Johannesburg and Durban, and questions around issues of cultural appropriation in the gqom scene and beyond in South Africa. 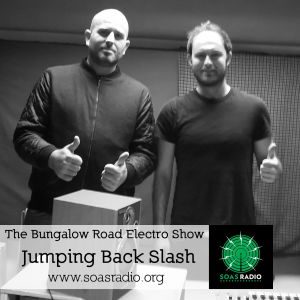 Big thanks to Jumping Back Slash for coming on the show. I sat down with Tendai Chagweda aka Petite DJ for an interview interspersed with . We covered loads of topics across... Read more..
Johannesburg-based crate digger, record store owner and curator of Afrosynth blog, DJ Okapi came to SOAS Radio whilst... Read more..
Bassist, composer and performer Shane Cooper came to SOAS Radio in between gigs in London and Switzerland to talk about... Read more..